Over the past few months overbought stochastics readings have given reliable short term sell/short signals. We are just about there right now. I used today’s strength to short gold via DZZ (300 shares at $29.22), which is a leveraged gold short. 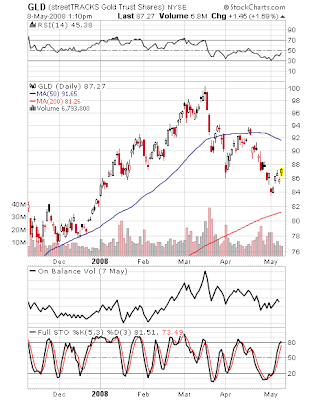 Here is the GLD chart. Pay attention to the stochastic reading. I don’t like that trade at all. I’m a buyer of gold here.Gold is barely off its recent lows. Chart still looks oversold to me.Hulbert has an article on Barron’s today about how sentiment is in the highest 10% bearish level for the last 20 years.I think this is a good entry for gold. Thanks for the response.I’m bullish for fundamental reasons. I think inflation is going to be an increasing problem in the years to come. That’s bullish for gold.In that context, the chart looks bullish to me. The 200 day MA is around $82 and that feels like support to me. So I interpret the recent action as a “correction” and not a “strong bearish downtrend” as you characterize it.Sentiment wise, what that Hulbert article tells me is that a lot of former longs have sold during the recent 2 month correction. I think that represents money on the side that could come back in.What sentiment indicators are you looking at that suggest another big move down? FF,I agree with your inflation/gold assessment for the long term. I am bullish gold in my longer term portfolio. This trade is on a short term time frame. If the 200 day at $82 acts as support and gets tested, that would be great for me (5 percent gain). what’s your stop on this one? Thanks.